Google on Monday introduced a new Nexus 4 smartphone to take on Apple's iPhone 5, a 10-inch iPad competitor named the Nexus 10, and launched a new version of its Nexus 7 tablet with cellular data connectivity. The trio of new products all run Android 4.2, what the company called a "new flavor" of its mobile operating system code-named Jelly Bean. The products were initially planned to be unveiled at a media event in New York, but Hurricane Sandy prompted the search company to cancel its media presentation. As such, the new products were simply unveiled via a press release on Monday. Co-developed with LG, the Nexus 4 has a quad-core processor and a 4.7-inch display that packs in 320 pixels per inch. The device also allows wireless inductive charging without the need to plug in wires. With Android 4.2, the Nexus 4 offers Photo Sphere, which allows for photos to be captured in 360 degrees. The new operating system update also has Gesture Typing, allowing users to slide their fingers over the letters they ant to type. Miracast is also a feature that competes with Apple's AirPlay, allowing users to watch movies, YouTube videos and games on an HDTV. Google Now has also been enhanced to add flight information, restaurant reservations, hotel confirmations and shipping details. The Nexus 4 is $299 for the 8-gigabyte model, and $349 for the 16-gigabyte variety. It will be available unlocked without a contract on Nov. 13 on the Google Play store in the U.S., U.K., Australia, France, Germany, Spain and Canada. A 16-gigabyte version will also be available through T-Mobile for $199 with a two-year service contract. With a screen size closer to Apple's full-size 9.7-inch iPad, the Nexus 10 has a screen resolution of 2,560 by 1,600 pixels, or 300 pixels per inch. Google partnered with Samsung in the design of its new 10-inch tablet. Google says the Nexus 10 offers nine hours of video playback and more than 500 hours of standby time. it also has forward-facing stereo speakers, and support for multiple users with Android 4.2, which can be selected from the device's lock screen. "We believe that everyone should have quick and easy access to their own stuff —email, apps, bookmarks, and more," the company said. "That way, everyone can have their own home screens, their own music, and even their own high scores." The Nexus 7 will cost $399 for the 16-gigabyte model and $499 for 32 gigabytes. It will be available starting Nov. 13 on the Google Play store in the U.S., U.K., Australia, France, Germany, Spain, Canada and Japan. 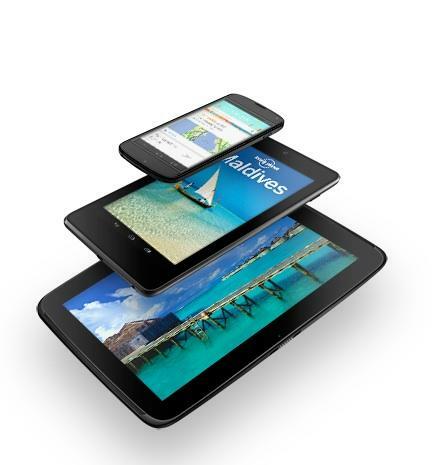 Google has done away with the entry-level 8-gigabyte Nexus 7, which was previously available for $199. For that price, users now get 16 gigabytes of storage, while a new 32-gigabyte model is also available for $249. A new high-end Nexus 7 is also available, offering 32 gigabytes of storage and HSPA+ mobile connectivity for $299. The device will operate on more than 200 GSM providers worldwide, including AT&T in the U.S. Unlike Apple's iPad and iPad mini, the new Nexus 7 with cellular data connectivity is not compatible with high-speed 4G LTE networks. The Nexus 7 is now available in the U.S., U.K., Australia, France, Germany, Spain, Canada and Japan on the Google Play store. It is also available through retail partners Gamestop, Office Depot, OfficeMax, Staples and Walmart. The Nexus 7 with mobile data will be available in the Google Play store starting on Nov. 13 in the U.S., U.K., Australia, France, Germany, Spain and Canada.